On Monday 19th November the Newman Society's Termly Mass will take place at 6pm in the chapel of Brasenose College. It will be a Traditional Solemn High Mass. All are welcome to attend. This is an event of great significance; it has been announced on the New Liturgical Movement blog by Br Lawrence Lew, who is to be sub-deacon. Fr Dominic Jacob of the Oxford Oratory will be celebrant. 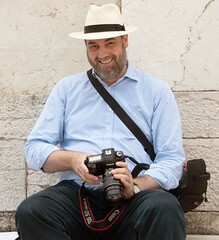 Congratulations to Michael Ryan, President of the Newman Society. Their last speaker, Fr Tim Finnigan said the Traditional Mass the morning after his excellent talk, after staying the night in Oxford. 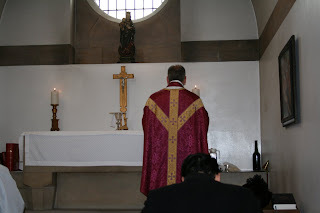 He celebrated Low Mass in the small St Joseph's Chapel in Campion Hall: see pictures. 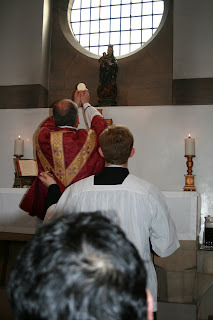 Their speaker this week (Tuesday evening: 8.30pm in the Old Palace) will be Fr Rupert McHardy of the London Oratory, alumnus of St Benet's Hall and a keen proponent of the Traditional Mass.